Wash lime, cut ends of and discard. Cut lime into eight wedges, place in an Old Fashioned glass and muddle with pestle. Add crushed ice until glass is two-thirds full. 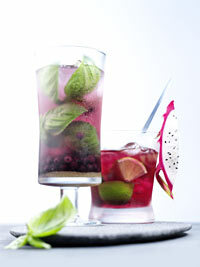 Pour in Wild Blueberry juice and cachaça and stir well. Hang dragon fruit or lime on glass rim to garnish. Serves 1.